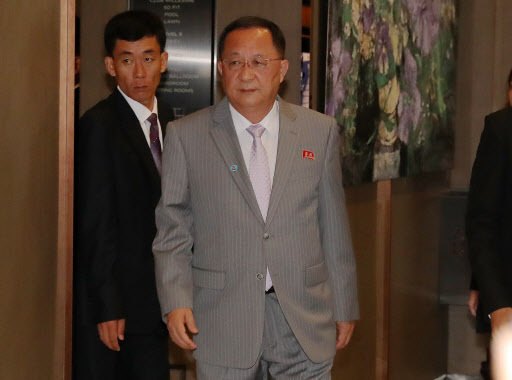 North Korea has not yet responded to South Korea’s request for a bilateral meeting on the sidelines of an annual regional security forum, as the North’s Foreign Minister Ri Yong-ho arrived in Singapore earlier in the day. South Korea has sought to hold a foreign ministerial meeting with North Korea on the sidelines of the Association of Southeast Asian Nations Regional Forum, which kicked off Thursday and brougt together key stakeholders in the Korean Peninsula’s denuclearization efforts. Expectations have been high for a possible meeting between South Korean Foreign Minister Kang Kyung-wha and Ri in Singapore amid a rapprochement in inter-Korean relations. The two Koreas’ top diplomats have held meetings on four occasions on the margins of the forum, with the last such meeting held in 2007. South Korea is awaiting a response from North Korea, given its neighbor to the north has a tendency of waiting until the last minute to respond. The US, which is engaging North Korea in denuclearization negotiations, is believed to be willing to hold a meeting with North Korea, but has not been contacted by the North. However, Kang, Ri and US Secretary of State Mike Pompeo, who arrived in Singapore on Friday, are set to all encounter each other at a working dinner scheduled for 7 p.m.
North Korea is believed to have offered to hold bilateral meetings with representatives from some six countries inlcuding Cambodia and Laos. A meeting between Ri and his Chinese counterpart Wang Yi was held earlier in the day. Ri’s every step is being closely watched by international media, as his visit to Singapore comes amid growing doubts of North Korea’s intentions to give up its nuclear program. Follow-up talks aimed at denuclearization have borne little progress, as the US and North Korea appear to be wrangling over declaring an end to the Korean War. The two Koreas hope to declare a formal end to the 1950-53 Korean War within the year as agreed at the April 27 inter-Korean summit. But the US remains reluctant, urging the North to take concrete steps toward denuclearization first. Led by the 10 member states of ASEAN, the regional forum brings together 26 countries and the European Union for talks on political and security issues in the Asia-Pacific region. It is one of the largest gatherings in the region to discuss security issues that concern the Asia-Pacific area. In recent years it has served as a rare venue for North Korea to interact with other countries.